Allen F. Weidhaas, Sculptor: What's New? INVITATION TO THE RUFFED GROUSE SOCIETY WEEKEND- Allen, along with several other well known artists, has recently been invited to participate in the 9th Annual Eastern Sponsors Weekend of The Ruffed Grouse Society. This event will be held in November at the Nemacolin Woodlands Resort and Spa located in the Laurel Highlands of Western Pennsylvania. The artists will be featured in a "Meet the Artists" Friday night "Quick Draw Event" which will conclude with the original works being auctioned off and the proceeds donated to The Ruffed Grouse Society. Other works by the artists will be included in the Grand Banquet and auction held on Saturday night. In addition, Allen will have the opportunity to display his work. This should be a very exciting and enjoyable three day weekend. The Ruffed Grouse Society is dedicated to the revitalization of the forest wildlife environment. Their address is: 451 McCormick Road, Coraopolis, Pennsylvania 15108. 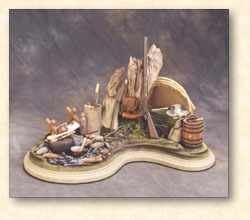 "TRAPPER'S CAMP" (above) is under consideration by a museum in North Carolina for permanent inclusion in their collection. They have organized a special drive to solicit donations for the necessary funds. This piece of work is being held for this institution. Allen has two other pieces in permanent museum collections: the Virginia History Museum, (The Virginia Historical Society) Richmond, Virginia and the Patrick County Historical Museum, Patrick County, Virginia. Photo enlargements can be found at the Gallery I wood carvings page of this website. NEW BRONZE- "Togetherness" (new born rabbits), a new limited edition of 45 castings in bronze is now available. This is a really charming piece depicting three newly born rabbits nestled together in a lackadaisical, snuggling composition. This piece is well suited for the coffee table or desk. See this new sculpture on the Bronzes page. WEBSITE UP-DATE Thanks to this site's Webmistress (QuarterMoon Digital Designs). The website has recieved major up-dates and expansion. Please take a look at all the hard work the Webmistress has done. New sections, photographs, and galleries have been added. Even the "What's New?" page is new. GENERAL STUART PORTRAIT BUST- Allen was commissioned by the J.E.B. Stuart Birthplace Preservation Trust, Inc. to do a portrait bust of General Stuart at the height of his career. The bust is an open edition and is cast in resin. The initial production run was 150 castings. When these sell out, another run of an undetermined quantity will be cast. They sell for $150.00, including shipping. You can see a larger photo, size, and ordering information on the Commissions page. All proceeds go to the Monument Fund for the costs of producing the sculpture. J.E.B. STUART MEDALLIONS Allen has designed two special medallions to be used as fund raising itmes with the proceeds again going to the Monument Fund. The Northwest Territorial Mint in Washington State was contracted to strike the medallions. They have produced a superb quality collectible. There is a 10th Anniversary Medallion marking the 10 years of the J.E.B. Stuart Birthplace Preservation Trust, Inc., and a special J.E.B. Stuart Monument Medallion. Each medallion is offered three ways: 1) in antique bronze; 2) in .999 solid silver; and 3) in silver-gold select, which is solid silver with selected areas in 24k gold. The silver and silver-gold select come with certificates from the Mint. They sell for $30.00, $40.00, and $55.00 respectively, plus shipping. For more information and ordering, contact the J.E.B. Stuart Birthplace Preservation Trust, Inc., PO Box 240, Ararat, Virginia, 24053. You might also like to visit their website and see the other information on their annual events. You can connect to their website from the Links page. MUSEUM OF THE CONFEDERACY, RICHMOND, VIRGINIA- The museum is currently selling the General Stuart portrait busts sculpted by Allen to help in the fund raising for the monument. They also offer for sale the different medallions Allen designed. SPORTING ART / SCULPTURE- The real definition of 'sporting art' is that art that includes the human figure in the composition and usually depicts hunting or fishing. Please take a look at Allen's "Stripers in the Surf" on the Work in Progress page. This is true sporting art. Allen plans to do other works that will include the human figure. One of the the next pieces he has planned will be of a turkey hunter. The hunter might be in a camouflage position among downed trees. And as a different type of work, could include a secondary sculpture of the turkey, which could be sold separately or together as a "package deal." MIMS GALLERY, NC- Allen completed a successful two-artist show with Robert C. Flowers (watercolor artist, Summerfield, NC) in November and December at the Mims Gallery at North Carolina Wesleyan College. Allen had a chance to share time with the students and patrons at the opening preview night on November 2, 2000. 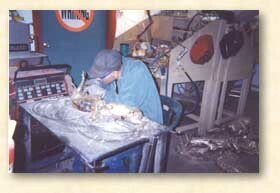 "FIRST SWIM"- Another bronze of a newly hatched loggerhead sea turtle is soon to be released (by May 1, 2001). This is offered in an edition of 45. HOSPICE COMMISSION- Last year, Allen was commissioned by Hospice of St. Mary's County, Maryland to do a special bronze sculpture of a Chesapeake Bay Retriever. The piece is to be utilized as a progressive yearly trophy for their annual Maryland Day 10k team competition run to benefit Hospice of St. Mary's. They have other events as well, but on March 24, 2001 this run will be the first for this new class. 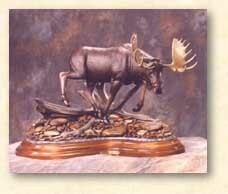 This piece is impressive, with a running and jumping Chesapeake Bay Retriever sculped and cast in bronze, approximately 12" long, mounted on top of a beautifully crafted 16 inch high walnut pedestal base. The base is embellished with fancy trim work. The front features the brass title plate and additional brass plates for engraving of the annual team winners. Pictures will be available soon for inclusion on this website. Look for them on the Commissions page. THE WORLD WIDE NATURE ARTISTS' GROUP- Allen has been juried into the World Wide Nature Artists' Group. This is a unique group of artists who concentrate the majority of their work on wildlife and nature. Allen has three pages on their website which links back to this main site. 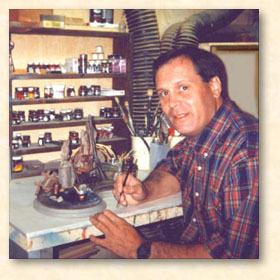 This is the major site for wildlife art on the Internet. Allen is honored to be associated with this group of well over one hundred world wide artists. Their link is on the Links page. BLACK BEAR CUBS- Another new sculpture is due to be released in late June, 2001. This will be an edition of 45, and will be available in a standard foundry patina and also in a colored patina version. As a side note, any of the bronzes Allen produces in a color patina can also be special ordered in a standard "Old World" (brown looking) patina. There are thousands of potential patina combinations. Even what Allen calls "Old World Standard Patina" can vary from a beautiful mellow brown to black. Our standard foundry patina is actually somewhere between brown and black. GALLERIES- Allen is represented by these fine art galleries and art agents. 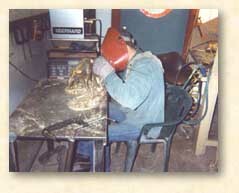 SHOWS- The next show Allen will attend will be Sculpture in the South on May 19-20, 2001 in Summerville, South Carolina. This is the annual sculpture show and sale held in Azalea Park. Sculpture in the South is a non-profit organization whose mission is to create a collection of permanent outdoor sculpture for placement in Summerville's public realm; to promote the appreciation of sculpture; to beautify Summerville's public areas; and to teach teenage apprentices the art of Topiary and community service. There is a patrons program and a preview night on Friday. This show is attracting well-known sculptors from across the country, and Allen is honored to be involved. Find their website on our Links page. 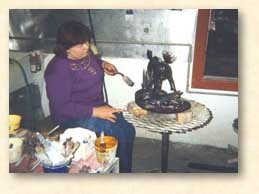 COMMISSIONS- Allen will selectively accept commissions for one-of-a-kind wood carvings and bronze sculpture. 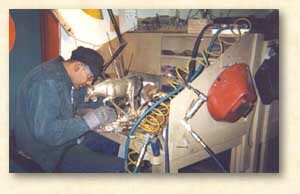 If you have a special project in mind, contact Allen as soon as possible, since scheduling has to be considered. Allen is normally working out at least 3 to 4 months, and he'll be looking for a time slot into which to fit the project. NEW BRONZE RELEASES- As new work is created, it will be listed in this section with a link to the bronze page. 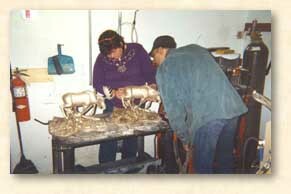 ORDERING- When dealing with bronzes, there can be time constraints involved, so contact the artist for availability, price, and shipping information. AWARDS- Allen was a nominee for the "Virginia Governor's Awards For The Arts 2000." The award recognizes excellence in and encourages the support of and investment in the Arts in the Commonwealth of Virginia. His nomination was made in the "Artist Category." (There were approximately 300 nominees in this category, made by an unknown second party.) The prestigious awards are an opportunity to celebrate the contribution of the Arts to the quality of life in Virginia. Allen was most humbly honored by his nomination. He was invited to the grand reception and awards ceremony held in Richmond, but was unable to attend.